ADH-44 is a premium, flexible, high strength, non slip/non slump powder mastic style tile adhesive used for wall & floor applications. Recommended over concrete, sand & cement screeds, green screed, cement render, fibrous cement sheeting for internal and external applications including bathrooms, laundries, toilets, kitchens, existing tiles, decks & verandahs. ADH-44 is suitable for adhering most types of tiles & porcelain including large format. ADH-44 Tile Adhesive is mixed with approximately 6L of clean drinking water per 20kg bag. Each bag will give you 7 square metres of coverage with a 10mm notch trowel. These features mean that it is a versatile and high-quality tile adhesive that is suitable for any worksite. In normal circumstances, no priming is required as ACT ADH-44 has unique Infused Primer Technology (IPT). When mixing a 20kg bag of ACT ADH-44 powder, you will require approximately 6 litres of clean drinking water. 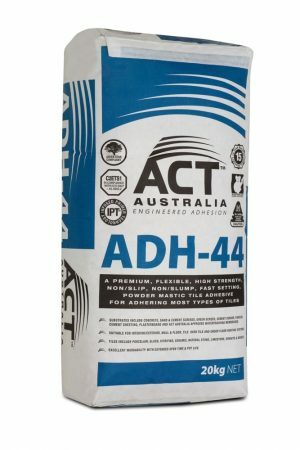 Slowly add ADH-44 powder into a clean bucket with the measured water. Following this, slowly mix with a quality drill & mixing paddle to ensure a smooth, lump free tooth paste consistency. Finally, leave the mix for 3 minutes then re-stir. Now the adhesive is now ready for use. After mixing adhesive, apply with the appropriate size notch trowel for the application. Ensure to work the adhesive to the substrate for good adhesion. Adhesive should sit up and not slump whilst being wet and tacky prior to laying tiles. Open time is approximately 30 mins at 23˚C. If the adhesive has skinned over prior to laying tiles then remove and apply fresh adhesive. Ensure minimum adhesive bed thickness is 2mm for wall & 4mm for floor applications depending on size of tile. Allow a minimum of 7 hours for the adhesive to cure and set prior to grouting. For impervious substrates such as waterproofing membranes and/or non-absorbent tiles further curing time will be required depending site conditions and ambient temperatures. Most importantly, ensure the adhesive has set prior to grouting. ADH-44 is our highest selling tile adhesive. This is due to the high- quality, versatility and ease of use. Use ADH-44 on your job today! Find out more about our most popular tile adhesive, ADH-44 here or see more of our popular product showcased on our Facebook.